In which G.M. Norton enlists the help of a timeless beauty as he introduces a new feature to your favourite periodical. Regular readers will know that I previously wrote about one of my style heroes, Sir Roger Moore. 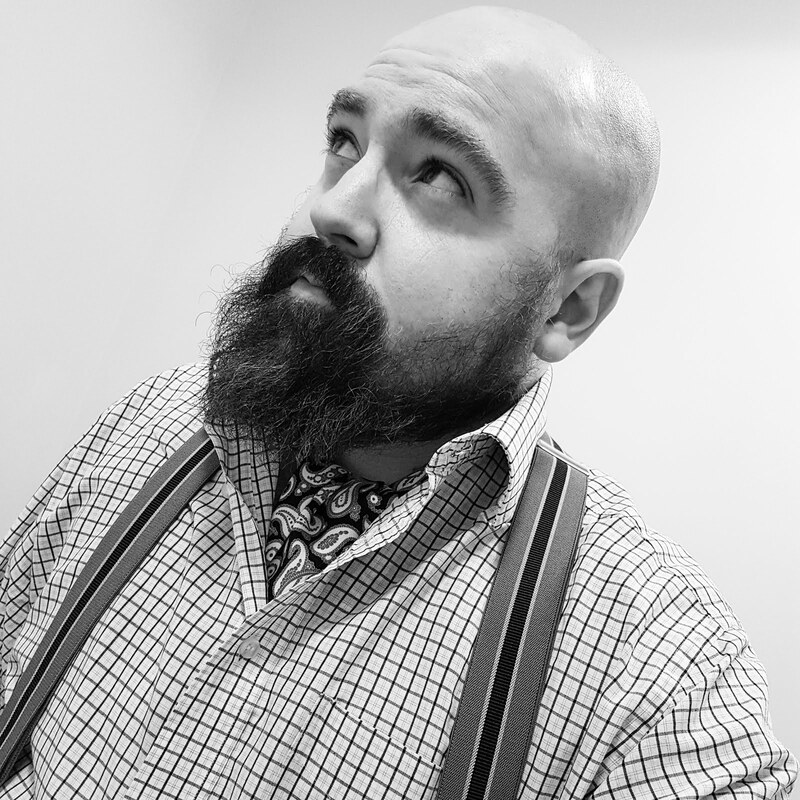 As a firm believer in equalities, in addition to showcasing stylish gentlemen, it only seems decent to also explore the unmistakable charms of some of my favourite ladies of the past and present. 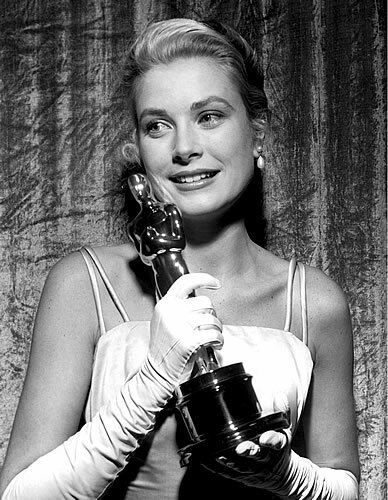 If you’ve not already twigged by the rather obvious heading, the first subject of the new ‘Smouldering sirens’ segment is none other than Oscar winning actress, style icon and Her Serene Highness The Princess of Monaco, Miss Grace Patricia Kelly. Grace Kelly was born on 12 November, 1929 and tragically died on 14 September, 1982. Suffering a stroke whilst out driving in France, she lost control of her motorcar, causing it to veer off the precarious serpentine road and down a mountain to certain death. She was only 52 years old. If you are not familiar with her filmography, this is one corner of silver screen history that any lady or gentleman would do well to explore. 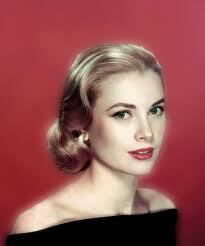 A wiser man than me once observed that Grace Kelly is “the most beautiful woman that has ever lived.” And he was right. Grace Kelly is the epitome of loveliness, first sashaying into my life wearing a shear nightgown in the Alfred Hitchcock classic Rear Window. From that moment, she had captured my heart, and no doubt millions of others. Her first appearance in Rear Window, the famous 'kiss scene' (see YouTube clip below) sums her up perfectly. As the camera pans to James Stewart catching forty winks, a shadow moves over him, awakening him from his sleeping slumber. 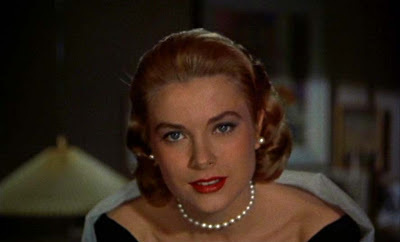 The owner of the shadow is then revealed – rather than some grotesque horror as is usual with Hitchcock, the beauty of Grace Kelly’s face fills the screen. She moves silently and in slow motion towards him, before planting a tender kiss on his lips, the lucky blighter. Her career was relatively short, spanning just eleven films before she made the decision to end her acting career and marry Prince Rainer of Monaco and in turn, fulfilling many girls’ dreams of becoming a real life princess. The three films that stand out for me are the one’s directed by my favourite director, Alfred Hitchcock – the aforementioned Rear Window, Dial M for Murder and the super stylish To Catch a Thief, starring alongside the one and only Cary Grant. However, it was for her performance in the 1954 film, The Country Girl, that Grace Kelly earned an Oscar for Best Actress. Does ma'am require anything else? Hitchock, the ‘Master of Suspense’, obviously adored her. 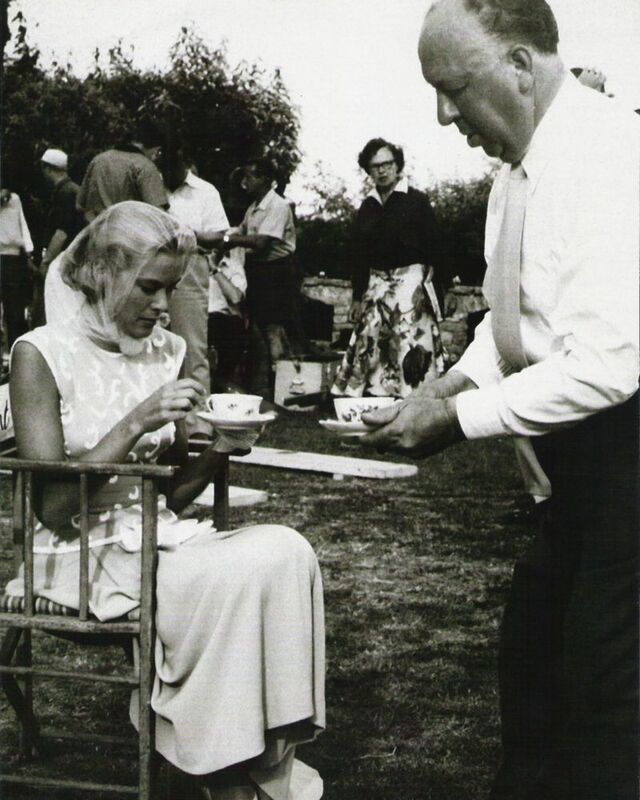 So much so that he played the part of rubicund butler as he served tea to her on the set of To Catch a Thief. It is proper tea too, served in a china cup, on a saucer, no doubt with a silver spoon. One struggles to imagine Darren Aronofsky applying the same level of service to Natalie Portman during the filming of Black Swan. "Grace brought into my life as she brought into yours, a soft, warm light every time I saw her, and every time I saw her was a holiday of its own. No question, I'll miss her, we'll all miss her." What a lovely homage to Grace Kelly. So I am sure a chap likes to carry himself assuming the air of George Sanders or channeling the wit of Terry Thomas and thus makes the mundane feel so much better. A man may not look like Gregory Peck or have the charm of Cary Grant but he can certainly use these people as inspiration. I too like to imagine how Grace Kelly would behave or dress and so inject the dull day with an injection of sophistication and ladylike elegance. Even the naughtiest of people get away with it if they can be charming while doing so! You are awfully kind, dear lady. I am delighted to make your acquaintance. I applaud your efforts to exude the style and sophistication of Grace Kelly, you obviously have highly commendable taste. I do hope you enjoyed your visit to my little periodical, please do stop by again.